My appreciation for music evolved something like this. When I was quite young, my parents gave me a compact, red and white record player. 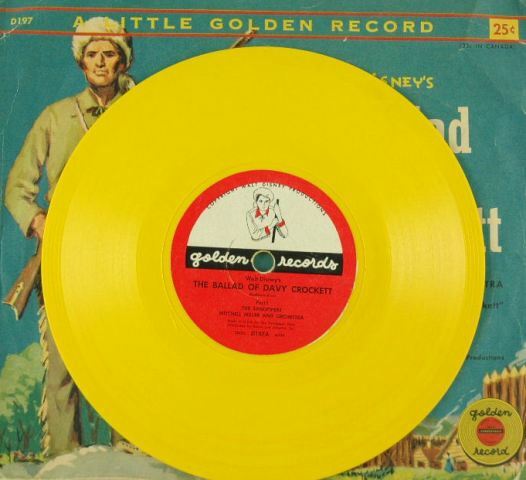 It spun those small, yellow, 78 rpm discs called Little Golden Records. I had a variety of them with titles like The Ballad of Davy Crockett and The Theme From Zorro. There was a Burl Ives song and a couple of spoken-word stories too. I can’t remember any specific story or title, but I can remember the last line of one that came at the end of side two. It went something like, “That’s the end of our story, boys and girls, but you can turn this record over and the circus will come to town again…” So I’d dutifully turn over the record and listen to the circus or whatever it was come to town again. It wasn’t long before my parents bought themselves a console record player. A big wooden box with a cloth grill on four skinny legs, pointed slightly outward at either end, you’d open the lid from the top and reach down inside to stack one or more records on a spindle. It was the first record changer I’d seen. Flip a lever, and the bottom platter in the stack magically dropped to the rotating turntable as the arm swung over and dropped precisely on to the starting band of the record. LPs and 45s were the height of recorded technology. The console was manufactured by RCA and it was monaural, which would become somewhat of a disappointment down the road. My folks enjoyed Broadway musicals. Consequently, so did I. The Music Man, Oklahoma, The Sound of Music, The King and I, Flower Drum Song and West Side Story were my favorites. Those and one 45 rpm disc belonging to one or the other of my parents, Rags to Riches by Frankie Laine. When you shop at Fox’s. Buy all your food at Fox’s. Unfortunately, the music on those stations was stuck in the 1940s. It wasn’t until I received a six-transistor radio from my parents a few days later that I could pull in Chicago’s WLS and discover magical songs like Del Shannon’s Runaway and Roy Orbison’s Crying. It wasn’t long before I had my own new, self-contained record player, about the size of a small suitcase with a turntable that pulled down to operate. It, too, was monaural. It, too, became somewhat of a disappointment after a while, an early lesson in planned obsolescence. I had a few 45s that I’d saved up to buy, first with allowance money and then with paper route profits. The Bonnie Bee grocery store downtown housed a small record section right next to the magazines, across the aisle from their “Kiddie Korral.” While I don’t remember exactly which of those early 45s were among my collection, Robin Ward’s Wonderful Summer might have been one of them. Whenever I heard it, I’d daydream about a certain neighbor girl singing it to me. While accompanying mom to the Bonnie Bee one day without any funds of my own, and after some well-executed begging, she bought me I Want To Hold Your Hand by the Beatles. It was in a picture sleeve with the four lads looking dapper in their collarless jackets and Paul holding that cigarette between his fingers, Sinatra style. Upon listening to it, I figured out why the neighbor girl was singing to me about what a wonderful summer I gave her. It’s because I wanted to hold her hand.